Big day in Texas. Several new laws are effective September 1, among them, it is now illegal statewide to text while driving and more importantly knife law changes go into effect and there is no longer a 5 and 1/2 inch limit on the size of blades that can be carried in public. That's right, open carry is now in effect for swords, daggers, spears and battle axes in the state of Texas. I read about that. Congratulations on reclaiming another piece of your freedoms! higgins wrote: Shall not be infringed. While there are many problems with my state, this is fortunately not one of them. Constitutional concealed carry and open carry of anything including knives of unlimited size. Now if you'll excuse me, I need to pick out a cavalry saber that matches my revolver. And here I am in Australia, where it's illegal to own pepper spray or a taser and illegal to carry a razor blade or scissors in a public place. Tasers are illegal for civilians in Estonia, too. thirtythr33 wrote: And here I am in Australia, where it's illegal to own pepper spray or a taser and illegal to carry a razor blade or scissors in a public place. Believe he's in Queensland. I think we had another Australian on our forum somewhere, too. Need to get you lot together or something. higgins wrote: I read about that. Congratulations on reclaiming another piece of your freedoms! Why do I feel like you live in one of the Carolinas or West Virginia? To be fair, it's not just the snowflakes that are alarmist. Over here in Aus, in a few weeks we have a national vote on whether or not to legalize gay marriage. From what I've heard, if the vote passes, this gay "problem will become widespread and compulsory" and school boys are going to be forced to wear dresses at school and roleplay gay relationships. It takes a single NNN (neo-nazi nut*) and a car to have a bloodbath, like last month's Charlottesville killing. Nothing to do with restricting (or not) possession of arms of any kind. * I'm aware of the pleonasm here. One can't be a (neo-)nazi and not be a nut. Especially this did caught my attention. Lawnmowers are roughly 7 times more lethal than terrorists. 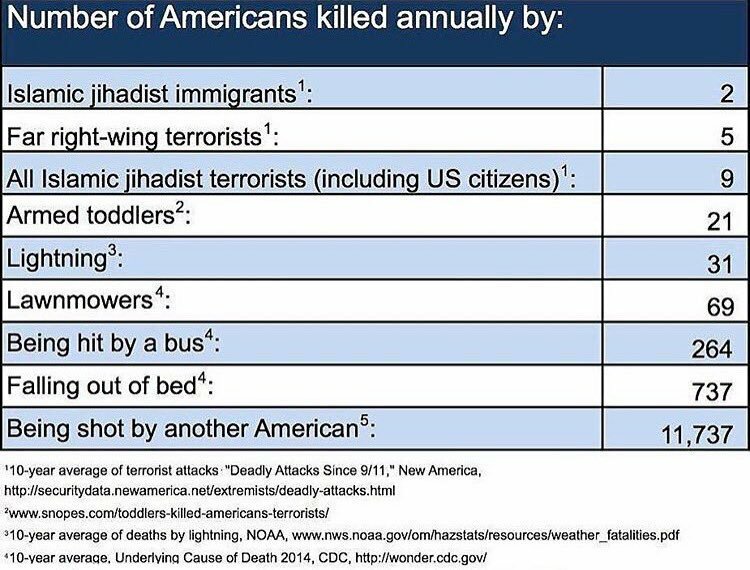 Increase lawnmower vs terrorist ratio by a tenfold to get falling out of bed lethality. It's amazing how people die and our perceptions on that matter.